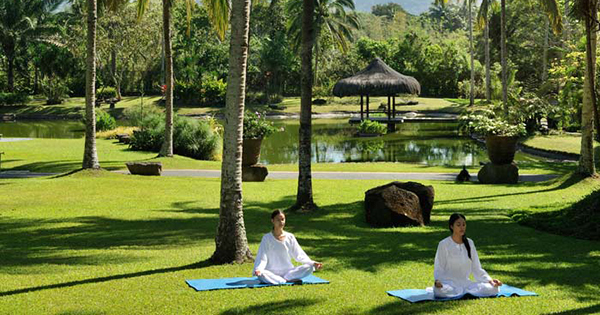 Many resorts in the Philippines are especially designed for people who are suffering from various medical problems. These healing and wellness resorts usually feature helpful amenities such as revitalizing hot springs, soothing massage spas, sanctuaries, detox centers, and amazing views that allow guests to fully relax. #1 - 88 Hot Spring Resort (Calamba, Laguna): There are numerous ways to measure this treasure’s worth – when you visit at 9601 National Highway, Bagong Kalsada, Calamba City, Laguna – and wade into one of their 11 rejuvenating pools! Since the ancient times, bathing into either hot or cold spring water that contains revitalizing minerals have been believed to give healing benefits for many people’s various ailments. They also have an on-site naturopathic health center! #2 - The Farm at San Benito (Lipa, Batangas): This facility is a centre for holistic healing and wellness where people balance their mind, body and spirit with nourishing live foods in an eco- friendly place.The Farm is a healing journey, a “must have” in every individual’s life at least once a year. This personal journey is needed for recharging one’s mental, physical, and spiritual state. It is the sole sanctuary of its kind in the Philippines and one of the best in the world. #3 - Catian Beach Resort (Coron, Palawan): If you’re in for another amusing spring, then head onto Maquinit Hot Spring – located at Sitio Maquinit, Barangay Tagumpay, Coron, Palawan! What is interesting about this invigorating treat is that you get to also see the sea nearby, next to its being enclosed by a refreshing mangrove forest. To top it off, Maquinit Hot Spring is also known as one of the few natural saltwater hot springs present in the world – thus giving more benefits than the freshwater hot springs for its higher content of minerals. #4 - Mambukal Mountain Resort (Murcia, Negros Occidental): Are you under a lot of pressure and you are not sure how to de-stress? Then your next step is to set out on your new year’s adventure towards the nature at Mambukal Mountain Resort – situated in Barangay Minoyan, Murcia, Province of Negros Occidental. Don’t fret, don’t sweat anymore and just look on the bright side! There is relief for your tired body through their hot spring pool that contains sulfur – which has been thought of to deliver therapeutic effects. #5 - Panicuason Hot Spring Resort (Naga, Camarines Sur): Once you get there, you’ll have a soft spot no doubt about enthralling Panicuason Hot Spring Resort’s natural hot and cold springs! Go ahead, and drench away your worn out muscles as well as take pleasure, as you gaze upon this place’ lush landscape all around you. You and your fambam can get to enjoy zip lining, wall climbing, Tarzan swinging, crossing a high-rope tension bridge, bike zip lining and staying in their comfy cabanas/cottages to boot. #6 - Asin Hot Springs Resort (Baguio, Benguet): You can float, swim, glide, or go wading through restorative Asin Hot Springs – whatever you do, all you need is to bring your sunshine with you over at Ben Palispis Highway, Tuba, Benguet. This captivating nature’s charm is just a 30-minute jeepney ride away from Igorot Park, in Baguio City – the Summer Capital of the Philippines, renowned for its whole year round spring weather – which is why many tourists, both foreign and local love to flock there to take a break from the heat that is felt mostly in Metro Manila and other low-lying parts of the nation. #7 - Ardent Hot Springs Resort (Tagdo, Mambajao): There is much enthusiasm you can fathom over at Ardent Hot Springs in Esperanza, Tagdo, Mambajao, Camiguin! Indulge with your ready to drop senses on the amazing health-giving benefits of its hot and shimmering water that emanates right out of the forest with over 40 degrees Celsius of temperature. This breathtaking gift of Mother Nature also possesses 3 other cooler pools arranged in tiers of waterfalls – thereby offering a refreshing bathe after a dip into the hot spring water in the highest pool. #8 - Twin Lagoon Resort (Coron, Palawan): Begin to thank your lucky stars as you raise the bar with your traveling by visiting, exploring and enjoying the Twin Lagoon of no less than, the Philippine’s Last Frontier – Palawan! Specifically located in Coron, Busuanga Island, this optimally fascinating site caters an unforgettable soothing floating experience with your life jacket on – hence, your exhaustion will be gone! Appealing to note about the Twin Lagoon is that it is where cold freshwater spring meets with hot saltwater spring for that awesome relaxing feeling while you are swimming! #9 - Puning Hot Spring Resort (Angeles, Pampanga): Soak up your knocked out body in the balneotherapeutic effect of Puning Hot Spring! (Balneotherapy means the treatment of disease by bathing, according to Wikipedia) You’ll definitely be over the moon there at Sitio Target, Barangay Sapang Bato, Angeles City, Pampanga, Porac – especially as you take advantage of their heavenly lunch buffet, hot springs pools, in addition to an exciting ride in their 4x4 vehicle for you to reach the 11 pools; not to mention, bask in their riveting hot sand therapy and healing mudpack – oh so remarkable! #10 - Hidden Valley Springs Resort (Calauan, Laguna): Your loads of joy will be written all over your face as you discover and relish the fun in the sun over at Hidden Valley Springs – which can be found in Calauan, Laguna! Be there with bells on and savor a dip into their refreshing and curative natural spring pools – that have been in existence since the pre-historic times. Besides, you will dig this exquisite attraction’s stunning flora and fauna, gym, spa, golf, yoga, mountain biking, and scrumptious meals no less!